Two volumes, each in a marbled paper slipcase, oblong 4to. Magnificently decorated slightly later full morocco bindings. Boards and spines richly gilt, marbled endpapers, gilt inner dentelles. All edges marbled and the edges of the boards tooled in gilt. Overall in an absolutely fine condition with the vast majority of the plates in pristine condition. Often it is assumed that this book is complete with 202 plates, probably based on the last number in the index of volume II, however, a complete copy should contain 205 lithographed plates plus 2 lithographed titlepages. The lithographs by J.A.M. and J.B.A. Jobard were printed by the latter, a Frenchman by birth who was naturalized in 1815. 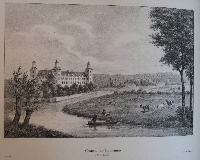 In 1817 he was the first printer in the combined Netherlands who started to use the lithography process. As the text pages are unnumbered, we have carefully studied them. Sometimes there is one page of letterpress per plate and sometimes the text for several plates has been combined. However, every plate is referred to in the text so that these volumes, also in this respect, are complete. The text was written by Jean Joseph de Cloet who also wrote the text for Voyage pittoresque dans le Royaume des Pays-Bas and several other works. 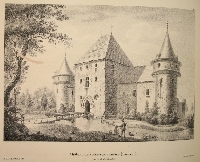 The plates of these castles and views are particularly attractive because of the vivid figures depicted here; walking, viewing or carrying out other activities in the direct vicinity of these mansions and sites. The lithographs in these volumes are by or after A. van Afferden, Bertrand, Colleye (signed on the stone), T.S. Cooper (signed on the stone; plate nrs. 112, 127, 132, 145, 165, 178, 181, 189, 194, 195 and 205), Goetgebuer, van Hemelryck (Jean-Louis Van Hemelryck; most of his plates signed on the stone with "VH"), Jobard, Kreins, C.V. Labarge, Lemaître, de Looze, Madou, de Marbaix, Mogford, Moreau, Pingret, Roux, C.H. Smith, C.A. Snoeck and Sturm. dant van koning Lodewijk, beoefende de teekenkunst. Bas en dergelijken in het licht." The printing history of this book is not entirely clear. Usually volume I is regarded to have been published in 1827, followed by volume II in 1829, but it seems very likely that the whole work only has appeared in installments, containing 6 lithographs each. The publication must have started as early as 1825, as the 4th part apparently appeared in January 1826 and the parts 6, 7 and 8 respectively in March, April and June that year (Revue bibliographique des Pays-Bas et de l’Étranger, ou Indicateur général). The price per issue was as high as ƒ 4.25 which makes it a very expensive publication resulting in a total price of ƒ 144.50 ; a small fortune at the time. An absolutely stunning beautiful copy of a book which is very rare when complete with all lithographs.